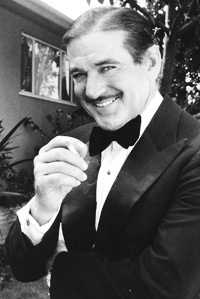 Rod Taylor plays "Black Jack" Bouvier, the father of the famous first lady in what ABC billed as an "affectionate portrait of Jackie and Jack Kennedy." The story begins when Jackie was 5 years old and ends following President Kennedy's assassination. 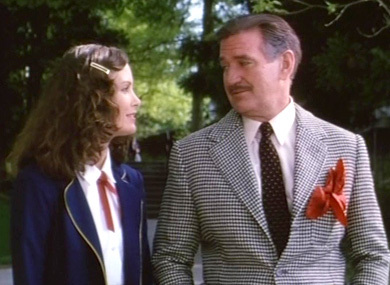 Jaclyn Smith earned a Golden Globe nomination for her portrayal of Jackie, but Rod steals the show from the very first scene. 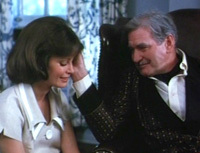 The New York Times agreed in an Oct. 14, 1981: "Bouvier, played with rough but affecting compassion by Rod Taylor, is the only character who brings a dash of life to the film's bland proceedings." The Times writer, John J. O'Connor, further described Rod's Jack Bouvier: "He is the determined charmer, telling his young daughter, 'We live in a special world -- it's a little bumpy but we always get up again.' Years later, he assures her, 'You were destined for greatness, my darling.'" 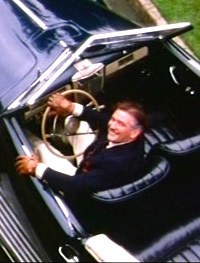 The show opens with "Black Jack" motoring along in a bright red roadster, on top of the world. As the story progresses, Black Jack's fortunes diminish, but he retains his charm and is adored by Jackie despite his flaws. 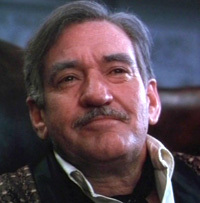 His final scene with his daughter should mark the end of the movie, as he bestows wisdom upon her that would serve her well: "Create an aura, maintain a little mystery, and above all, never let them know what you are thinking." 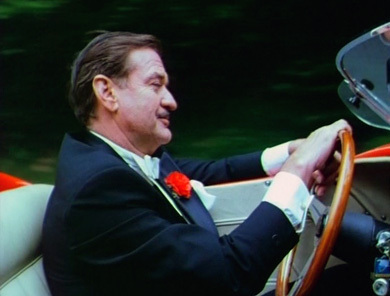 The movie dies along with Black Jack, as the show stumbles along through the Kennedy administration, assassination, and wraps up with some corny "Camelot" references. There is, upon this film's frothy field of taffeta, one genuine and dimensional performance -- Rod Taylor as Jackie's ne'er-do-well but adored father, "Black Jack" Bouvier. Now that Taylor is too old for the macho muscleboy parts, his face has suddenly become interesting and full of character. And with a little Gablesque pencil mustache, he makes a touchingly downtrodden old sport, grandly keeping up appearances and telling his daughter to get up and walk after she falls off a horse. One begins to long for Taylor's reappearances since he is about the only excuse for a human being in the picture. 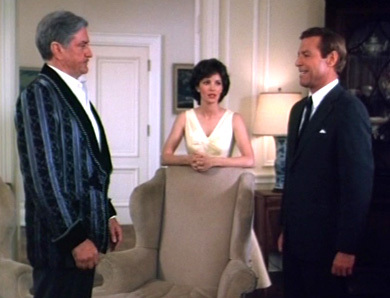 He pops back into the story when the Bouvier-Kennedy engagement is announced, trying to bum a cutaway coat off a clothier so he can pridefully give the bride away. But while the wedding ceremony is taking place, the camera searches him out in his hotel, where he has fallen asleep drunk. Rod Taylor is wonderful as Black Jack Bouvier, Jackie's father... Black Jack was ... "the most important relationship in her life," [said Steven Gethers, the director and writer of the TV movie]. It is certainly the most important relationship in the movie. Jackie's father was apparently something of a gadabout, a drinker, a carouser. He loved all the finer things in life, and considered his rebellious, independent-minded daughter one of the finest. 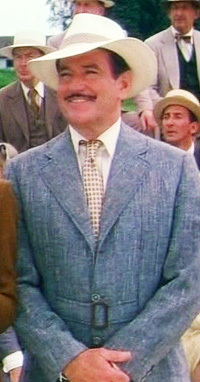 In another interview, Gethers said, "Rod Taylor had a chance to play a kind of character he'd never done before and gave one of the best performances of his career." [Jackie's] hard-drinking, womanising, gambling father, Black Jack Bouvier, is given a gutsy representation by Rod Taylor who, it is said, drew on his own hard-drinking and womanising experiences for the part. He is now a changed man. During the filming of this flick, Taylor said: "Considering my past, I've finally been given a role I truly deserve. It's natural casting." A reviewer in the Detroit Free Press (Mike Duffy, Oct. 14, 1981) thought the scenes between James Franciscus and Jaclyn Smith were bland. 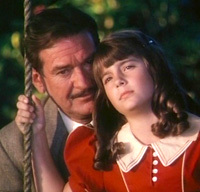 "Not so, however, with the scenes during the movie's first hour involving Jacqueline and her father Jack Bouvier, played with devilish, poignant flair by Rod Taylor. Bouvier, known as Black Jack, was a flamboyant rascal who wore flashy clothes and drove flashy cars. His apparent mission in life was to carouse. He drank too much by far. "There is a genuine father-daughter tension and love in the scenes between Smith and Taylor. In those few moments, [the show] slips out of its candy-gram straitjacket."